Our first order of business this morning is to go over the fantastic options idea we formulated on Monday morning, after a massively deadly air disaster involving one of Boeing’s new model Max 8 737′s occurred over the weekend. Our targets were the BA Weekly $375-367.50 Puts, and not only did they all work, but they all exploded for huge multi-bag gains in an incredible 2-day swing of ten-to-twelve baggers! We’re going to flip this idea on its head after learning this morning that Boeing stands to make significant gains as a result of the Trump Admin’s $700B+ DoD budget request. We’ll look to the BA Weekly $380-385 Calls. We never stop hitting up options chains with good ideas that allow us to see big gains in a short timespan. You could check through years of our archives and see for yourself, but simply reading our daily reports is more than enough to get the gist. The cycle doesn’t stop. Fresh for yesterday morning’s report, we signaled our interest in tracking the MOMO Weekly $34.50-36 Calls, and those all worked out beautifully as well in just a single session. Barracuda Networks, Inc. CUDA - On Friday, we had just caught CUDA coming off of a heavy earnings beat, and we signaled our interest in a couple sets of contracts in the options chain to correspond with the expected activity. Specifically the CUDA 07/15 $15 and $17.50 Calls. It was a good thing that we did, because what followed were some eye-popping gain opportunities! The $15′s have now traded up from a low of 2.55 to a high of 6.53, for an excellent swing of 156%, while the $17.50′s have amazingly run from .60 to as much as 4.10, a huge 583% rip! 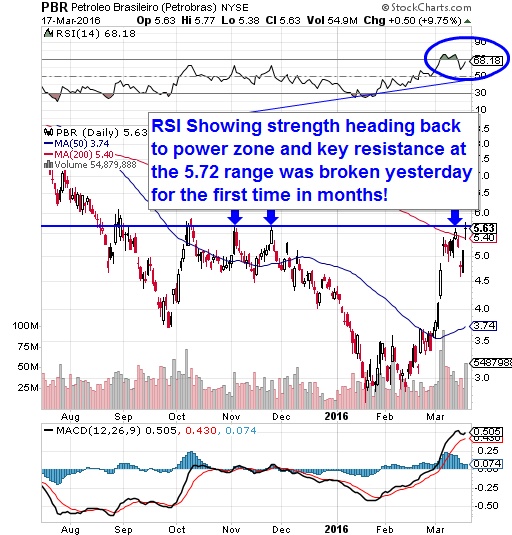 Petroleo Brasiliero S.A. (Petrobras) PBR – We’ve drawn off of the PBR well countless times in the past, and our most recent idea, the PBR 07/15 $6.50 and $7 Calls (which we submitted on the morning of June 29th) has paid off with a couple of sizable swings. In the roughly two weeks since we tabbed these plays for observation, we saw the $6.50 Calls run first from .30-1.07 (+256%), followed by a dip back to .35 and a rip back to 1.27 (+263%). The $7′s provided similar, yet even bigger action as they initially saw a move from .15-.69 (+360%), followed by a second from .14-.85 (+507%). We expect the gains mentioned here to be extended as PBR is gapping up again this morning, and we may need to consider rolling up our strike prices to the $7.50 and $8 Calls as the situation dictates. We also want to provide an update on another idea from the end of last week. We were circling back around to GORO on Thursday, a play we’d begun tracking two weeks prior from a low of 3.19. We produced three sets of options ideas in yesterday morning’s premarket report, and considering our recent track record with options plays, it should come as no surprise that we hit on some big gainers with all of them. We’ve successfully come up with winning options ideas for PBR on so many occasions, we’ve lost count at this point. Our targeted contracts yesterday were the Weekly $5 and $5.50 Calls, and both sets recorded solid moves on the day. For the $5′s we saw a nice run from .42-.77, an intraday swing of 83%, while the $5.50 Calls doubled that performance with a 166% pop from .12-.32. We mentioned that the idea could serve for swing trades into today, and it appears as if PBR’s gap up will extend the gains we’ve seen thus far, especially considering that oil is presently at its highest price in months. In addition to staying on top of those 5.50′s, we’ll explore the possibility of rolling up our strike price to the 6.00-level. We’ll just need to see the stock hold support at its previous resistance point of 5.72 on any early pullbacks. The next idea we came up with was to take a look at UPS April 8th $104 Calls, which we found attractive for a number of reasons that we listed in our report, and those contracts put up a top-notch performance as well. They started out from a low of .47 and would end up hitting a daily high of 1.50; gains of up to 219% were there for the taking. We were very interested in Seaworld’s PR concerning the halting of the Killer Whale breeding programs and theater show phase-out yesterday(>>View PR). The announcement was received well by the investing community, as well as the company seeing goodwill on social media for doing the right thing- at one point on Twitter, #Seaworld was trending in the Top 3 for the US in the wake of the news. We set our sights on SEAS April 15th $18 Calls, and were met with an excellent intraday gain opportunity as they ran 150% from .40-1.00. We also want to give ourselves a pat on the back for SRCO, which we included in yesterday’s extended watchlist. The stock made a respectable intraday move for us, to the tune of 60% as it traded in a range from .003-.0048 on roughly six times the 3-month average volume. BAC is currently gapping up in the premarket on news that the company will be increasing the scope of their share buyback program, and we’re going to signal a set of options contracts for observation to correspond with that. We’re going to be taking a look at BAC Weekly $13.50 Calls for a possible daytrade*. *Don’t forget, trading weekly options contracts on a Friday is a very risky proposition, and is recommended for seasoned traders only. We played PPCH like a fiddle this week, after calling attention to it in Tuesday morning’s premarket report. That morning, we observed a low of .0188 and the stock hasn’t looked back since. What followed has been three consecutive sessions of higher highs and higher lows. Yesterday’s intraday performance alone was quite respectable, with PPCH running from a daily low of .0225 to a new high of .037. That represented a spike of 64% on the day, and a total increase of 97% over our observed low from Tuesday. We’ll be interested in PPCH as long as it maintains support above the current 50DMA (.019), while the next bank of resistance is sitting at the 200DMA at .042. We offered our two cents on how to take advantage of Dollar General’s earnings beat yesterday, and that was with the DG Weekly $78-80.50 Calls. With the exception of the 80.50′s, which didn’t trade much volume, every one of the contracts in our target range exploded for exponential gains! *As we always do, let us warn our readers o the extreme caution which must be exercised by anyone attempting to trade weekly contracts on Friday. It’s a high risk proposition, and not for the faint of heart! We also want to take a second and update readers on another of our recent successes. MXSG started appearing on our radars back on February 5th when it was as low as .0016. In a little over a month’s time we’ve witnessed a 1025% gain (a/o yesterday’s .018 high).